All this talk of keywords and SEO begs one obvious question: What keywords do you want to use for your Etsy listing? Suppose you hand-craft bracelets out of bottle caps. Sure, you can use keywords like bracelet or even jewelry in your item listings — in fact, you should. The problem is, you’re not the only one using those terms. A recent search for the term jewelry yielded roughly 336,000,000 matches. Adding bracelet to the search string narrowed the list somewhat, but it still yielded almost 80,000,000 hits. Including bottle cap got it down to about half a million. No doubt about it, 500,000 is better than 336,000,000 — but not if your shop is buried in the bottom 499,999 matches. When most people use a search engine, they don’t dig deeper than the first few pages of search results. To increase traffic to your Etsy storefront, you must ensure that links to your items or shop appear in those first few pages — preferably page one. 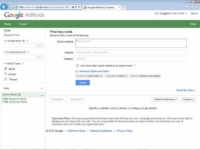 1Launch your web browser and go to Google’s Keyword Tool. 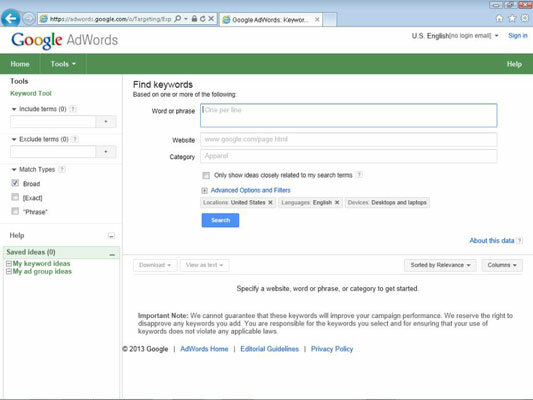 The page for the Google AdWords Keyword Tool opens. 2Type any keywords or phrases that you use in the Word or Phrase box. Include one keyword or phrase per line. 3Fill out the CAPTCHA form — that is, type the characters that appear in the picture. So they know you aren’t a robot. 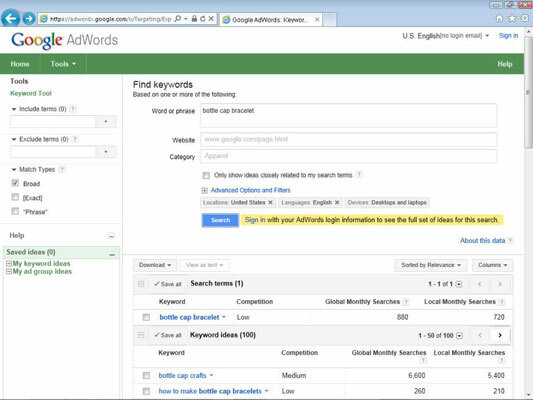 The Keyword Tool shows how often the keywords you typed are searched, as well as other keywords you may want to consider. More than 700 local searches focused on the phrase bottle cap bracelet. That is, over a one-month period, 700+ people in the United States searched for the phrase bottle cap bracelet. Another search reveals that, in the same period, more than 9,000,000 people searched for the term jewelry. 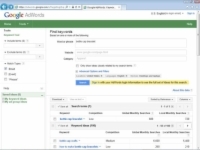 Now, you may think that you need to focus on the higher-volume keywords or phrases. After all, more people are searching for those. But given how many matches are in that category, the chances of your shop or item ranking near the top are essentially nil. You have a much better chance of appearing near the top of the results for a narrow search, like bottle cap bracelet. What about finding keywords that may work better than the ones you’re using? Simple. Just read through the list of keywords that the Keyword Tool spits out to find ideas for keywords or phrases you can use. This list contains actual search terms that people have entered into search engines to find items like yours. In this example, you may add bottle cap jewelry or bottle cap crafts as keywords. Don’t forget, you can use Etsy Shop Stats to see which keywords visitors used to find you on Etsy.